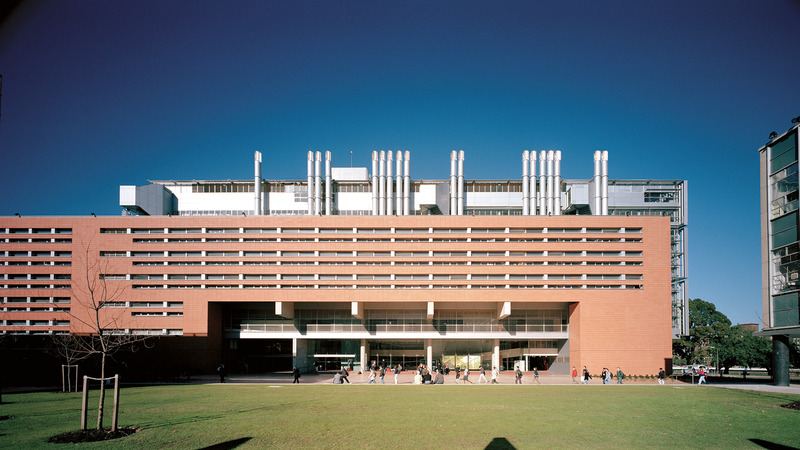 The University of New South Wales undertook an extensive building programme to transform a placeless 1960s campus of object buildings into interrelated courtyards and public places. The site of this project is at the edge of a degraded linear landscaped mall. 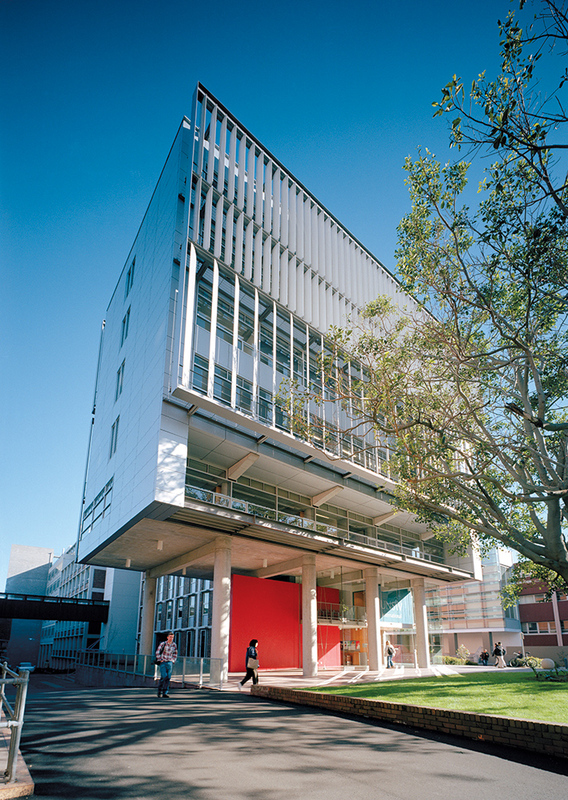 Here, an existing building is refurbished and two new buildings added: an international centre and a new school of architecture. The sloping central mall was a lost opportunity, a potentially central axial space neglected and compromised by developments of the last thirty years. Our project uncovers this potential and transforms the mall into a unifying and identity-giving public space complemented by two significant public squares.  The expression of separate buildings was rejected in favour of a continuous linear form defining the mall. A planar wall of terracotta tile stretches across new and existing buildings, cut and folded to define the two public squares. This wall is the public face of the building. Minor openings for offices are suppressed to form continuous, linear coursing-like slots. Entry, exhibition and public spaces are given monumental expression through large openings and folded planes. Behind this terracotta plane, the new building takes the form of two glass and metal volumes suspended on columns. The first volume sits opposite the main square and extends westward to reach down the mall and announce the presence of the square. The second volume located at the eastern end of the complex is turned through ninety degrees to define and characterise the second new square. This composition of terracotta plane and recessed metal and glass volumes mediates the scale of the new building and complements the existing brick and curtain wall structures. To the south, the building takes a more fragmented form, responding to the courtyard, lane and service ways that provide only partial glimpses and lateral views. 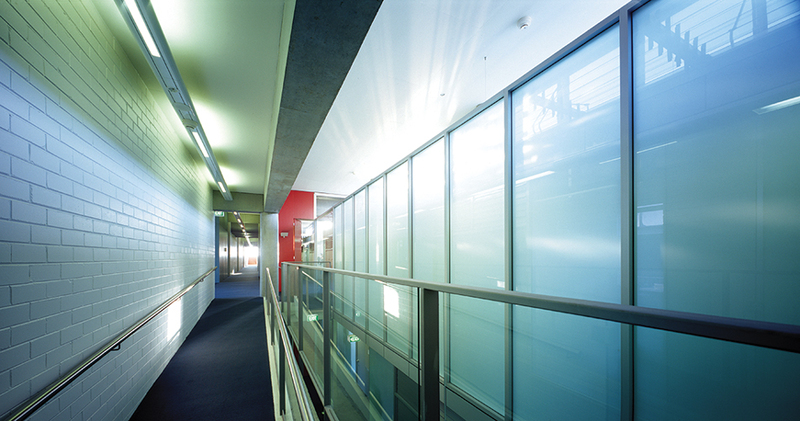 Working closely with Arup, we developed a passive system of cooling, heating, ventilation and lighting. 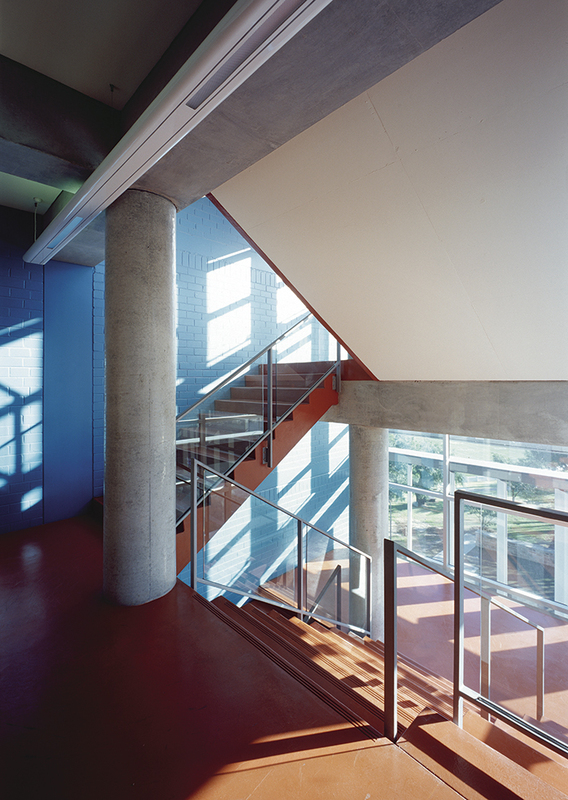 These passive environmental control systems are integral with the form, structure and representation of the building. For example, the independent terracotta plane that has such a significant urban and representational role is not merely a formal/symbolic strategy. The twin window design in a deep reveal was developed to simultaneously address environmental control and comfort. 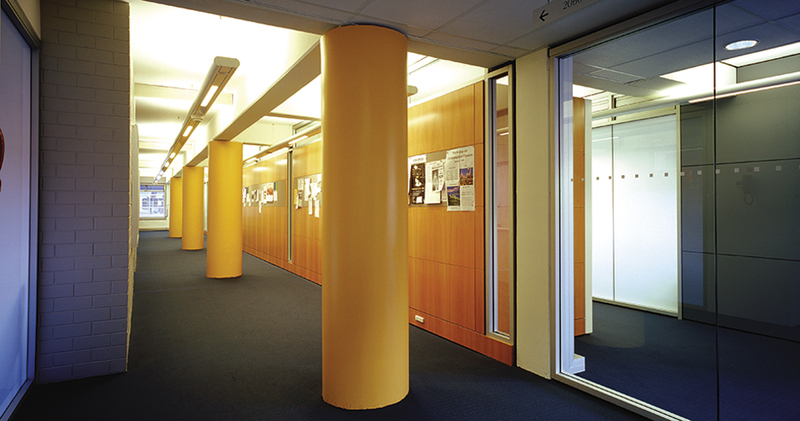 The twin openings provide even natural daylighting throughout the offices, with light penetrating deeply from the upper window and from the light shelf action of the reflective upper sill. The deeply set openings give appropriate sun shading and the twin opening design provides a carefully positioned window, able to be opened for views, with higher-Ievel fixed glass for daylight, between which is an integrated bookshelf. Air can be drawn into the room through the open window or louvres integrated in the upper sill, which also serve as trickle vents. 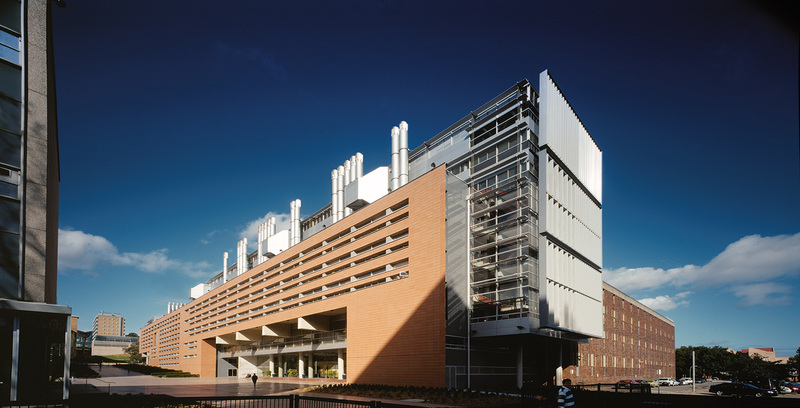 These “breathing” façade systems are complemented by a ventilation system that draws air into the building through low-level vents and expels it through central air shafts connected to thermal flues. These flues are located on the north face of the building so the natural solar heating assists the drawing of cool air from low-level vents. Automatic dampers in the airshafts are adjusted according to the outside air temperature, so that air is drawn in to reduce temperature and cool the mass of the building for radiant cooling. In winter, the flow of air is reduced and the sunshades are adjusted for passive heating. 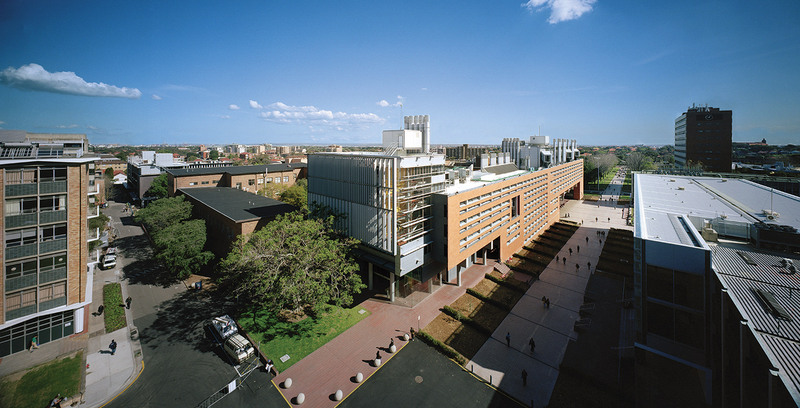 The Red Centre is a sustainable tour de force that challenged the environmental standards for Australian campus architecture.